CARLA ROSSI guest judges the May 31st edition of DRAGATHON! Portland's Most Popular Drag Competition Returns!!! 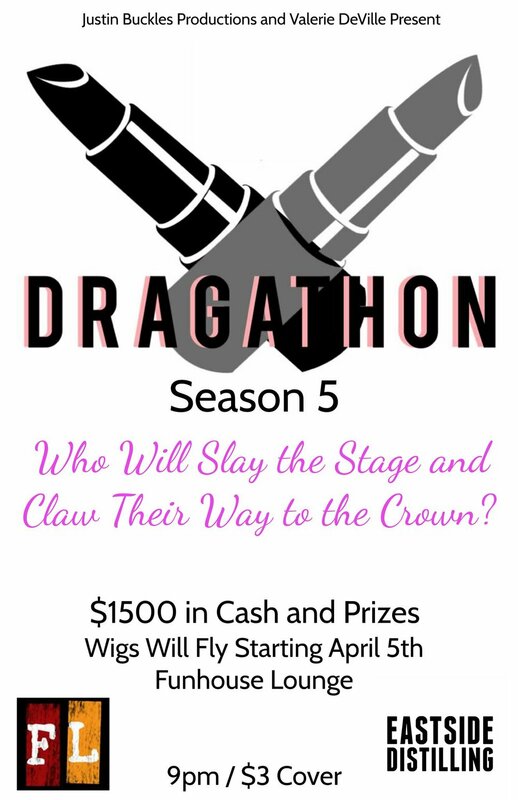 Season 5 of Dragathon kicks off at Funhouse Lounge Thursday April 5th and runs through Thursday June 14th! The Winner receives a prize package worth over $1,500, including cash and prizes! Who Will Slay the Stage and Claw Their Way to the Crown? Hosted by Valerie DeVille and produced through Justin Buckles Productions! Our weekly mentor will be Dragathon All Stars Winner Alex Horsey! Presented by the lovely folks at Eastside Distilling! Doors will open at 9pm and we'll have a $3/$5 cover each night. The cover will go towards compensating our contestants and show staff weekly! Arrive early to get the splash zone seats and be prepared to cheer on your favorite contestants. Also don't forget to vote for them at the end of the night with the ticket that you'll receive at the doors once you pay your cover! Funhouse Lounge starting Thursday April 5th!